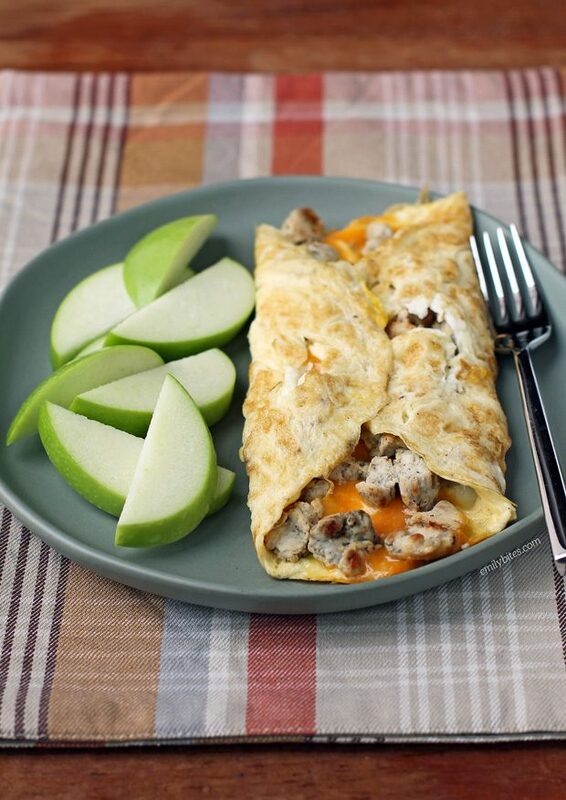 This Turkey Sausage and Cheddar Omelet makes a healthy, filling, low carb breakfast that’s packed with flavor. Making your own homemade turkey breakfast sausage is a snap (it just takes a minute or two to mix in a few seasonings) and it allows you to create a super lean sausage that tastes amazing. This omelet is simple to put together and if you’re only making it for yourself you can easily whip up the sausage and then use it to make one omelet at a time for a few days. You can also customize this recipe by adding in your favorite vegetables or herbs or using your favorite cheese – it’s a great base recipe! 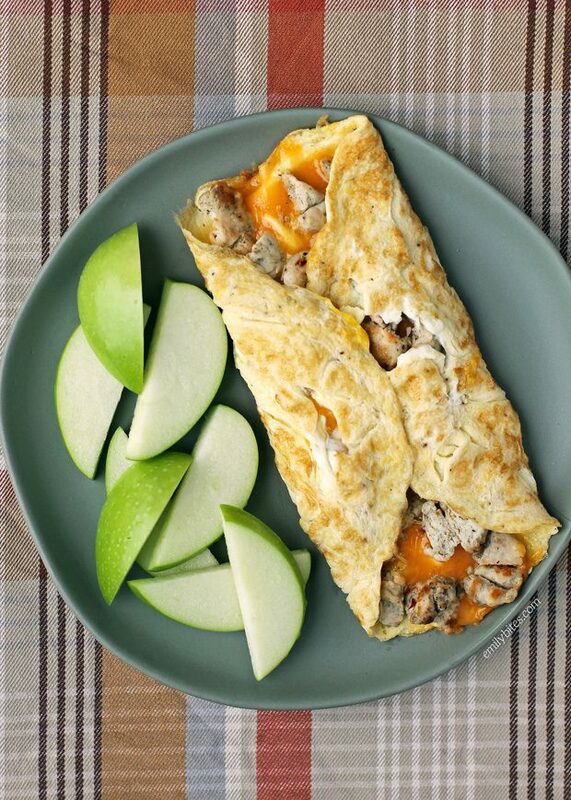 As written, one Turkey Sausage and Cheddar Omelet is just 236 calories or 2 Weight Watchers Freestyle SmartPoints, with only 2 grams of carbs and a whopping 34 grams of protein! Looking for more tasty, lightened up breakfast ideas? Check out my Berry French Toast Muffins, Sausage Apple Cheddar Frittata, Ham and Cheese Egg Cups, Orange Cranberry Baked Oatmeal Singles, Butternut Squash Autumn Frittata, Apple Streusel French Toast Muffins, Pear Gingerbread Baked Oatmeal Singles, Hummus and Feta Omelet, Ham and Cheese Hash Brown Quiche, Blueberry Baked Oatmeal Singles, Mini Dutch Baby Pancakes, Sausage and Stuffing Brunch Bake and many more in the Breakfast category of my recipe index! In a mixing bowl, combine the ground turkey with the salt, black pepper, sage, thyme, marjoram and crushed red pepper. Stir (or mush with your hands or a fork) until the turkey is well combined with the seasonings. Mist a medium nonstick skillet with cooking spray and bring to medium heat. Add the seasoned turkey and cook, breaking up with a wooden spoon or spatula, until the turkey is cooked through and broken into small pieces. Remove the turkey sausage to a side plate and wipe out the skillet with a paper towel. In another mixing bowl, combine the egg, egg whites and water and sprinkle with a bit of salt and pepper. Whisk together until thoroughly blended and beaten. For each omelet, mist the medium skillet with cooking spray and bring over medium-high heat. Add the egg mixture to the pan. Use a spatula to push the eggs from all around the edges into the center so that the set eggs are pushed into the middle and the egg liquid seeps back to the edges of the pan. When the edges are set and the center is getting there, sprinkle an ounce of the shredded cheddar in a line down the center of the omelet, then follow with a quarter of the turkey sausage (for me this was 1.8 ounces cooked) so that there is a straight line of filling down the middle. Use a spatula to fold one side of the omelet over the center filling, then tilt the pan (folded side first) toward your plate and use the spatula to slide the omelet onto your plate and fold the other side of the omelet over the filling. Serve. Repeat to make additional omelets (or you can store the turkey sausage from step one in the refrigerator and use it to make omelets for the next few days. Curious how you got 2 freestyle points? When I put it into my WW app, I’m coming up with 5 points per serving? I put all of the ingredients into the WW recipe builder. Everything is zero points except the cheese. I used 4 oz of Cabot 50% reduced fat sharp cheddar which is 9 points for all four servings. The recipe builder therefore gave me a per serving value of 2 SmartPoints. If you are trying to enter the nutrition information into the points calculator that will not work for recipes that include any of the zero point foods. The recipe builder counts them as zero points but they still have calories, fat, sugar, etc. Hope that helps! You know what I figured it out right after I posted this. LOL This new system can be a little confusing sometimes! Thanks so much! Still trying to figure out smoothie points too! Guess I better start going to meetings so I can get a better handle on this. If you use 99% fat free grounf turkey breast it is 0 points. It has to be breast meat only. If you use 93% (Or whatever) ground turkey it has points. very yummy and healthy food.